Time for “BLOOM BASH” tonight at the San Diego Museum of Art! Tonight’s the night! 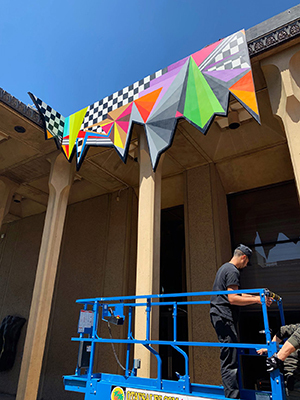 Flashing back through the week to the beginning of installation on the BLOOM BASH 2019 “Geo #98” mural at the San Diego Museum of Art in Balboa Park. A few of the first panels going up of the 44 piece, 176ft creation which is now completely installed along the roofline of Panama 66 to be all lit up and unveiled at the opening #bloombash party *TONIGHT* Friday, April 12th from 7pm until 12am. 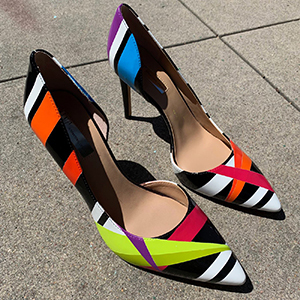 A little peak at the custom painted pumps for Sarah Grossman to hit the dance floor in as well! Thank you so much for everything Sarah! Go to this link for “Bloom Bash” tickets NOW! 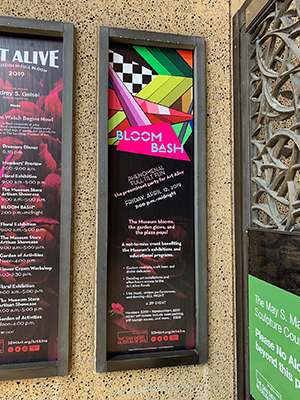 Bloom Bash Tickets: https://www.sdmart.org/event/bloom-bash/ Also visit ”Exhibits” on montymontgomeryart.com for more information. Thank you TEAM! @sandiegomuseumofart @polychromist @pacificeventproductions @steffbadgett @djagow @oneeyedlauren @sdmasocial @balboapark and so many others!